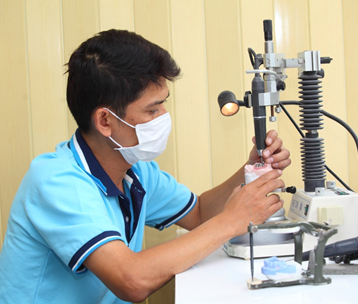 Excel Dental Lab Co., Ltd.
Implant dentistry has been around in dental industry over several decades. Our implant technician team has the experience, technology and tools to provide quality restorations and services around any implant system utilized for your patient’s treatment plan. 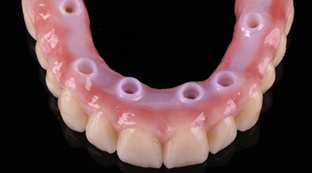 Nowadays, there are a wide variety of options in implant prosthesis. We can fabricate cementable or screw-retained restoration based on your choice. We can prepare a prefabricated abutment from original manufacturer, or wax and cast a UCLA custom abutment traditionally, or mill a custom abutment by CAD/CAM technology. 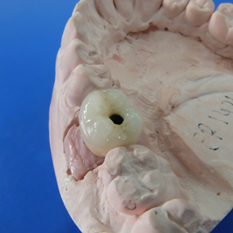 The abutment materials can be Titanium or zirconia with Ti base. If you are unsure, we can make recommendations based on interocclusal space, implant angulation, parallelism, tooth anatomy, and esthetic concerns. Your implant clinical cases can be complicated and challenging. We will help you succeed and meet patient’s expectations. All implant abutments are precisely milled by our highly advanced surveying & milling unit. Our most senior technicians with vast implant experience work on your cases with utmost attention based on widely-acceptable dental theories and techniques. We work with a variety of Implant & Attachment Systems. 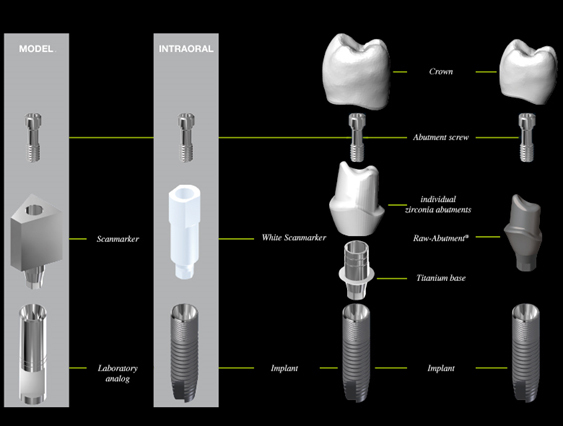 Choose from a variety of prosthetic crown options for implant, based on your esthetics and strength requirements. Screw-retained has made a come-back. Our screw-retained crown is affordable, durable, esthetic, retrievable, and eliminates cement at the margin. Screw-retention eliminates the need for cement, which means there is no clean-up and no worry of leaving cement behind. This solution is available for most major implants. 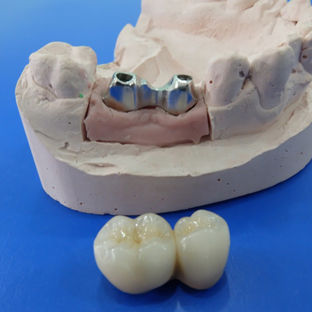 Although porcelain-metal is still a prevalent choice, the crown and abutment portion can be-zirconia, and the interface is titanium. Optionally, the crown can also be fabricated in full-contour zirconia which makes them extremely durable. Our removable implant solutions provide you with reliable restorations that utilize the latest technology. The Locator Implant Overdenture is indicated when there are at least two implants in place, and is most common in the mandible. The Locator bar, either milled manually or by CAD/CAM, distributes occlusal loads more evenly across four or more implants, making it ideal for patients with a heavy bite or when the implants have been placed in softer bone. Copyright © 2019-2020 Excel Dental Lab Co., Ltd. All rights reserved.